One of my favorite weddings last year was at Khimaira Farm in Luray, VA. It’s been a little bit since I’ve shared a full wedding post with you so let’s go for it! Travis and Heather were married in my absolutely positively FAVORITEST (!) 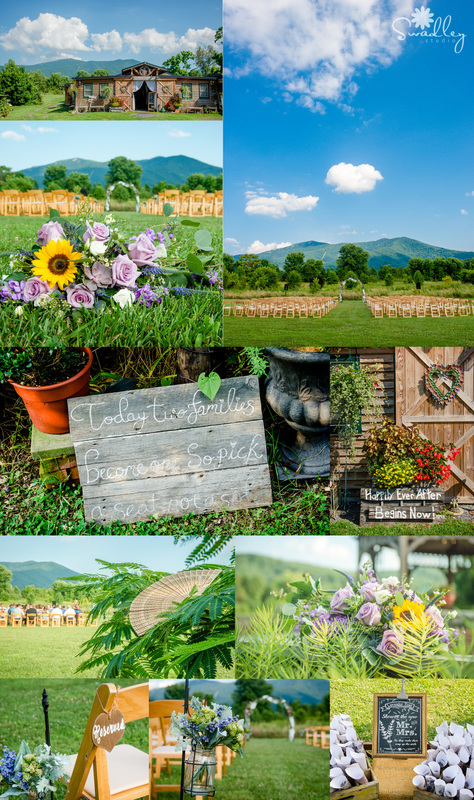 venue in the whole wide world, Khimaira Farm, in Luray Virginia. I have to say… maybe it’s because we had our own wedding there and just being there gets us all nostalgic about our own wedding day, but I’d like to think that there is something beyond nostalgia that drives this element of magic to each wedding we photograph at Khimaira Farm. If you’ve ever been there, you probably know exactly what I’m talking about! The wedding details from this event are my absolute favorite ever! I am so happy that we were lucky enough to be chosen as their wedding photographers. Heather and her mom were a dream to work with, and listened to every suggestion I had while we were building the photography timeline for the day. This makes such a HUGE difference in how many pictures you will get, as well as how well the day will flow. There are so many options that they can use for their album, and I absolutely cannot wait to see what they choose for it! Enjoy the photos (there are quite a bit! ), and let us know what we can do for you! 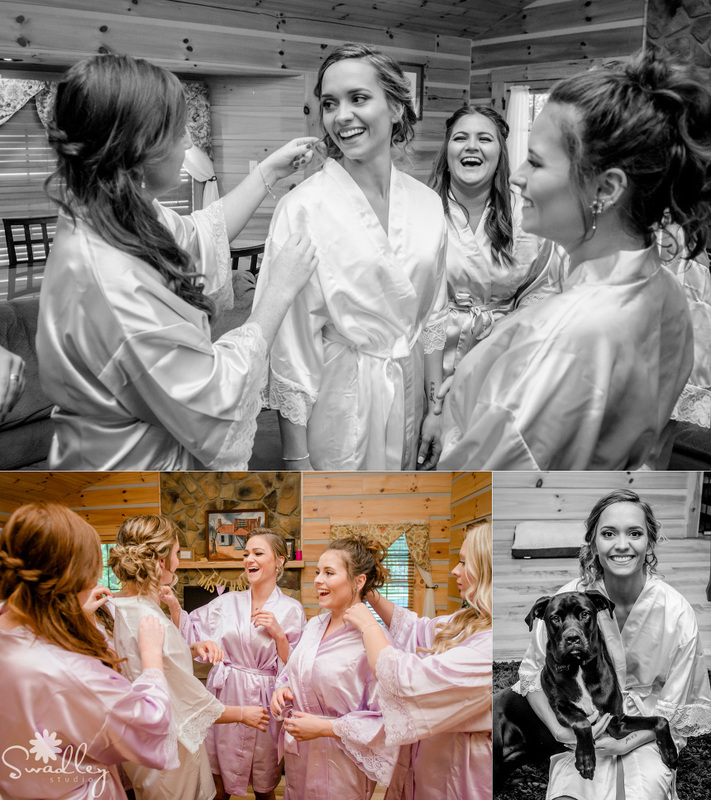 The girls got ready at their cabin at Shenandoah Woods in Luray, just down the road from Khimaira Farm. When we all arrived at Khimaira, Heather wanted to check out her reception area. BREATHTAKING!!! Heather is a professional dancer and so I incorporated images that portray her love for dance. I always love the energy in these 5-10 minutes after the ceremony… nothing but pure ecstatic joy! And OH MY GOODNESS, look at this dessert spread!!! SWOON! Sadly, Heather’s father passed away so he couldn’t physically be there. But during this special dance with her uncles, it certainly felt like he was there in spirit. Not a dry eye in the house (including my own!). So many amazing dance pictures!!! Someone PLEASE invite me to a wedding like this so I can partake in the dancing!!! If you’ve been here to the blog before, you’ve probably seen this shot we captured toward the end of the night. If not, here’s the story again… Khimaira has this awesome sofa that you can use for your photography. Everyone uses it during the day, so I wanted something different (as always, lol). I knew I wanted to do a night shot, but it was somewhat cloudy and completely pitch black (no moon to help with lighting). I knew if I opened the shutter long enough I could get a nice blue or purplish tint to the sky against the mountain in the field where they held their wedding ceremony, so that’s where I decided to do it. While Travis & Heather were busy dancing and mingling with their wedding guests, I recruited a big strong guy to help Jon carry this sofa down steps, around a house, through a garden, past roaming critters all the way to the middle of this field. You can’t tell from this picture, but trust me when I say it was pitch black. I used my phone’s flashlight to guide the way, but it was still pretty dark and hard to see holes in the ground. Once Jon & I set up the shot, we went and found Travis and Heather. 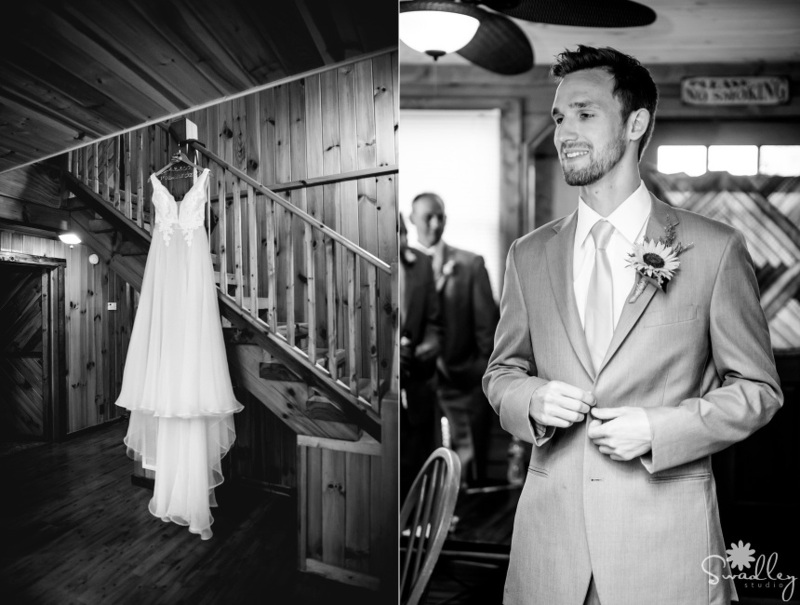 I was in control of exposure and posing, and Jon was in control of lighting the couple. It took us one song to pull them away and have them sent back on their merry way. When looking at the shots on the back of my camera, I knew we got the perfect shot, but it was still really small so I couldn’t see the stars in the shot until I got home and pulled it up. After I brought out the highlights and bumped up the background exposure, I was thrilled when I saw this amazing shot of the Milky Way in the perfect position behind them! It’s like it was positioned there just for them (perhaps her dad had something to do with that!). Thank you so much Heather & Travis for trusting us in the complete dark to give you something special from your wedding night. I couldn’t just choose one, so here’s another one! Thanks for following along on our photographic journey! If you would like more info on our wedding photography, use the contact form at the top of this page to request our exclusive wedding magazine. We also shoot senior portraits, newborns and headshots and would love the chance to work with you! Follow us on Facebook, Instagram, YouTube and Pinterest to get updates on everything happening here at Swadley Studio! Cody & Angela were married at St. Bridget of Ireland Church in Berryville, VA and celebrated their wedding reception at Bowling Green Country Club in Front Royal, VA. Jon & I first met up with Angela at her parent’s home in Winchester, VA for getting ready photographs. The weather had called for heavy downpours during the hours we were to be shooting wedding portraits, but we lucked out and only had rain for the drive over to the church. It was absolutely perfect! Greg with GS Productions always knows how to pack the dance floor! Guests always have a great time at his receptions! I met up with Amanda of Lux Photography recently to write a short article for this month’s Blue Ridge Bride about the First Look. I’ve been anxious to post this article for all the brides-to-be out there, because this is something that is still “new” to this area, although in other areas of the country it has been much more commonplace. For those of you not familiar with this growing trend, the First Look is a private moment between the bride & groom before the ceremony. Usually, the groom is facing away, the bride comes up behind him, and the only people there are the photographers to capture the intimate moment that takes place. The bride gets to hear what the groom thinks right away, the groom gets to express his true feelings (instead of being a “man” and controlling his emotions in front of 100+ guests), and they both get more time to see each other on their wedding day. And, if you’re wondering if it takes away from the moment of walking down the aisle? Ask Jon… he was the biggest skeptic ever, and was still not sure about it until it happened… now, he is a true believer! Ask anyone else who has ever done it! Check out the article, and then make sure to read on to see other comments I have about the First Look that couldn’t be squeezed into the article. Now, I could go on & on for days talking about the First Look. I honestly feel that this should become a part of every modern wedding. I’m not sure why it is still so taboo to some people to not see each other until the walk down the aisle, especially considering the reason behind that tradition we discussed in the article. Did you know 100 years ago we carried garlic down the aisle to ward off evil spirits? I’m glad that tradition was replaced with beautiful-scented flowers instead! Did you know that we used to have our fathers tie all our old shoes to the car to signify the fact that our new husbands were the ones that were now responsible for us (and the husbands would beat us over the head with these shoes to show us who was our new “boss“….)? Did you know that in ancient times, guests would smash wedding cake over the brides head to wish her luck? And think about this… It was a very strong tradition that the bride’s father would pay for every penny of the wedding. While this still happens today, I’m finding most of my couple’s are funding the wedding either partially themselves, or with help from all parents involved. Since this is not a business transaction between father & groom any longer, it just doesn’t make sense to HAVE to follow that tradition… and so we have for the most part grown out of that. Do you follow us on Instagram? If so, you probably noticed this gorgeous shot of Zach & Victoria from August at Khimaira Farm in Luray, VA. We have been doing lots of gorgeous night shots when the sky is clear enough to see the stars, so I wanted to make sure I posted this one here. It was pitch black outside, and we use flashlights to make sure we aren’t running into trees or holes in the ground while setting these shots up! I love that during the summer, the Milky Way is visible in the perfect position at Khimaira Farm! How incredible is that!?! My favorite one is next, followed by a few others that were posted on the Instagram feed from earlier in the day. Thank you for following along on our photographic journey! If you would like more info on our wedding photography, use the contact form at the top of this page to request our exclusive wedding magazine. We also shoot senior portraits, newborns and headshots and would love the chance to work with you! Follow us on Facebook, Instagram, YouTube and Pinterest to get updates on everything happening here at Swadley Studio! My community service project aimed at reducing the stigma surrounding opioid addiction has gained so much attention all over the world. Fortunately, in the last couple years I have seen many minds being changed from this being a morality issue to one of understanding and compassion. I am hopeful that we can get through this horrible epidemic that is taking so many lives and destroying so many others. If you are new here, check out this post to learn about the project. In doing these mini-stories, the hardest part has been condensing someone’s tremendously multi-faceted addiction story into a one or two paragraph blurb on Instagram. I have gained a new level of admiration for journalists who do this all day! When I met with my latest subject, Shannon (pictured below), she talked for almost 50 minutes about her life in addiction, and I could tell that she could have went for hours longer. As I was trying to pull out a short story from her words to post, I felt I needed to post more of her story. She had sent me a copy of a letter that she sent to a teenage boy recently who was struggling with addiction that captured a good portion of her story, so I asked if I could share that here. She was more than willing to share any information that could help someone else. I am so blessed to have met so many amazing humans who are doing such incredible selfless work in our community, and working to better themselves in the process. Start by reading the Instagram post shown, and then continue with her letter below to one of the many people she is trying to help (names have been changed). Be sure to follow me on Instagram here for periodic updates to the 52Addicts Project! If you don’t have Instagram, you can view all the stories posted so far at the links provided at the bottom of this blog post. my organization, and what exactly Drug User Unions are and do. street and then, like so many others, moved to the cheaper option of heroin. lied, cheated, and stole from those I loved, and put the family in financial ruin. home to return to my heroin addiction. root. No one expected me to make it out of surgery. told him, “If you send me home I will die! I’m an IV heroin user and I need help”. life, and make a real attempt at getting sober. and I was already on antibiotics, so I’d be fine. Talk about irrational thinking! be told a truth that hurts. are okay with the support of Drug User Unions behind you. Update #1 can be found at this link. Update #2 can be found at this link. Update #3 can be found at this link. Update #4 can be found at this link. To get these stories as soon as they are published, follow along on our Instagram page here! Thanks for following along on our photographic journey! If you would like more info on our wedding photography, use the contact form at the top of this page to request more information. We also shoot senior portraits, newborns and personal brand photography and would love the chance to work with you! Follow us on Facebook, Instagram, YouTube and Pinterest to get updates on everything happening here at Swadley Studio!